Art. Food. Music. Movies. Fun. It’s our Summer in France. 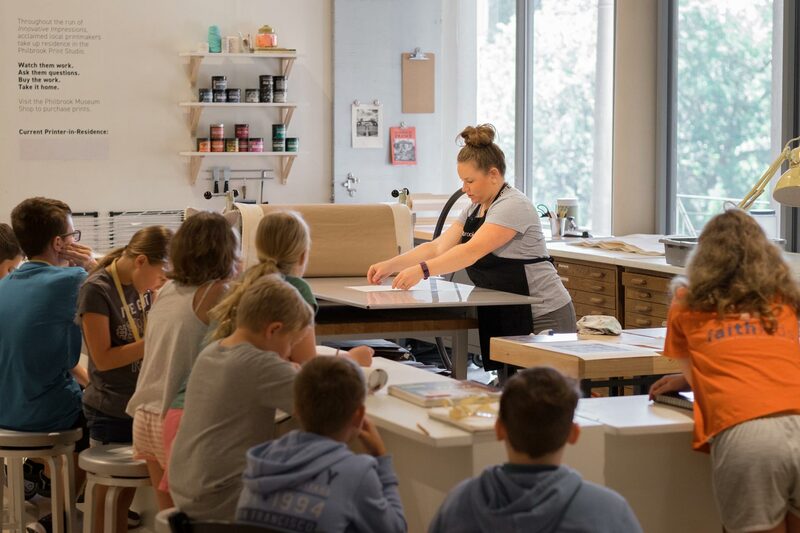 Philbrook Museum of Art is proud to present an original exhibition, Innovative Impressions, along with delightful programming all summer long. In partnership with Tulsa Global Alliance, Philbrook Members can win a trip Tulsa’s sister city, Amiens, France, by registering during any museum visit. All summer long, we’ll be showing movies on our Film Lawn: The Goonies, Moulin Rouge!, Ratatouille, Ferris Bueller’s Day Off, Labyrinth, The Shining, and a “people’s-choice” double-feature. We’ll also have our new Friday night routine, Burger Night, going every week, with burgers, beer, activities, and live music. Check our full Calendar for upcoming events. Read on to learn more about our exhibition and summer-long programming. See you soon. The Philbrook-originated show Innovative Impressions explores the groundbreaking prints and techniques developed by Impressionist masters Mary Cassatt, Edgar Degas, and Camille Pissarro. While many Impressionist painters are known for their innovative methods, these three used their collaboration and experimentation to expand the boundaries of the print medium. Philbrook is the exclusive venue for the exhibition, which is curated by Sarah Lees, Ruth G. Hardman Curator of European Art, and features a wide range of prints along with key paintings by each artist, lent from collections across the US. The Philbrook permanent collection features many works by French masters such as William-Adolphe Bouguereau, Raoul Dufy, Rosa Bonheur, and many more. Burger Night, Every Friday. All summer. Kitchen 27 is the latest concept from acclaimed Chef James Shrader (Palace Café, Prairie Fire Pie). Incorporating items directly from Philbrook’s onsite Edible Teaching Garden, Kitchen 27 combines a relaxed, casual setting with delicious dishes and fresh ingredients. Enjoy patio season with our new Friday night routine. Kitchen 27 offers a burger bar with classic, turkey, and vegan (black bean) options. $8.50 each. Includes truffle fries. Patio or inside seating available. First come, first served. Enjoy live music on the patio every Burger Night. We bring in the sounds of summer with musicians like David Horne, Mike Cameron, and Seth Lee Jones. Grab a burger, grab a seat, and enjoy the tunes. Open for lunch, weekend brunch, and Friday night dinner, Kitchen 27 also provides full-scale catering services for your next party, wedding, or private event. Kitchen 27’s name is inspired by Philbrook history (founded 1927) and the Museum’s location (2727 S. Rockford Rd.). Watch classic films on our beautiful Film Lawn the fourth Friday of every month. Enjoy Kitchen 27’s Burger Night or bring your own picnic, take part in activities, enjoy live music, and more. $8/Philbrook Members. $6/Not-yet Members. Activities begin at 6 PM. Films start at dusk. Just outside the Innovative Impressions exhibition, we’ve invited local artists/printmakers to be in residence at our very own PRINT STUDIO. Watch them work, ask them about the process, and see creativity in real time. Pick up a copy of the official Innovative Impressions catalog exclusively, available exclusively in the Philbrook Museum Shop, alongside many other unique gift items inspired by French art, culture, and style. For shop inquiries, call 918-748-5304.